Southdown Motor Services was formed on the 2nd June 1915 by the merging of three companies. One of the companies, ‘Worthing Motor Services’ was using a pleasing apple green and cream livery and it was this livery that was chosen for the new company. Over the years the company has been a firm favourite with bus enthusiasts, although the original company has now passed into history we are blessed with a good number of preserved Southdown vehicles that we can all enjoy. 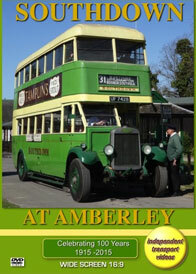 The excellent Amberley Museum & Heritage Centre in West Sussex is home to a superb collection of former Southdown vehicles, many dating back to the 1920s and 1930s. On the 12th April, in Southdown’s one-hundredth year, 2015, the museum put on a special event to mark the anniversary. They ran most of their historic collection of Southdown vehicles along with a number of visiting Southdown buses and coaches, which added to the historic scene. The independent transport videos cameras were at Amberley to record the event. Set in a disused chalk pit, the museum has developed over the years to create a bygone era, with buildings, long lost crafts, a small railway, a fire station, a country garage and of course a Southdown bus garage from the 1930s. All this gives a lovely backdrop to our film as we see the buses running in service just as they would have done in days gone by. Apart from the many locations chosen for our film at the museum we take some rides on the buses to get even more atmosphere and to see how much bus design has moved on over the years. Rides were taken on 873 (UF 6473) a 1930 Leyland TD1 with a Leyland 48 seat body, 1205 (UF 6805) a 1930 Tilling-Stevens single decker with a Short Bros. body seating 31, 928 (UF 7428) a Short Bros. bodied Leyland Titan TD1 dating from 1931 and 347 (HCD 347E) a 1967 Leyland PD3/4 with a Northern Counties full fronted 69 seat body built in 1967. The oldest bus in service on the day was IB 552 a Tilling-Stevens Petrol/Electric TS3 with a Newman body dating back to 1914. This bus was one taken over from Worthing Motor Services at the formation of Southdown in 1915. Our penultimate ride of the day was on board 24 (ECD 524) a 1937 Leyland Cub with Park Royal B20F bodywork beautifully restored at Amberley. Our final ride was on a 1929 Leyland Titan TD1 with a Leyland low height body that was built originally as a trolleybus, but was transferred to its current chassis, which still has a petrol engine from 1931. The bus ran with Jersey Motor Transport and when it was withdrawn from service in 1960, had the distinction of being the last petrol engined bus to run in service in the British Isles. We hope you enjoy your journey back into the past with our celebration of one hundred years of Southdown Motor Services.